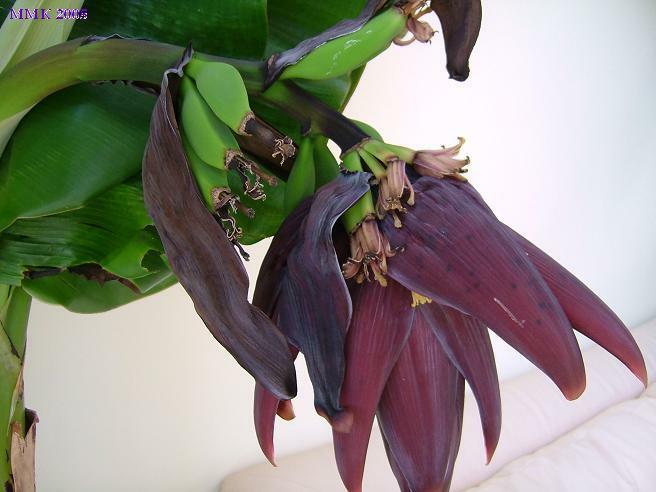 The banana plant, often erroneously referred to as a 'tree', is a large herb, with succulent, very juicy stem which is a cylinder of leaf-petiole sheaths, reaching a height of 6-7.5 m and arising from a fleshy rhizome or corm. Suckers spring up around the main plant forming a clump or 'stool'', the eldest sucker replacing the main plant when it fruits and dies, this process of succession continues indefinitely. As the young fruits develop from the female flowers, they look like slender green fingers. 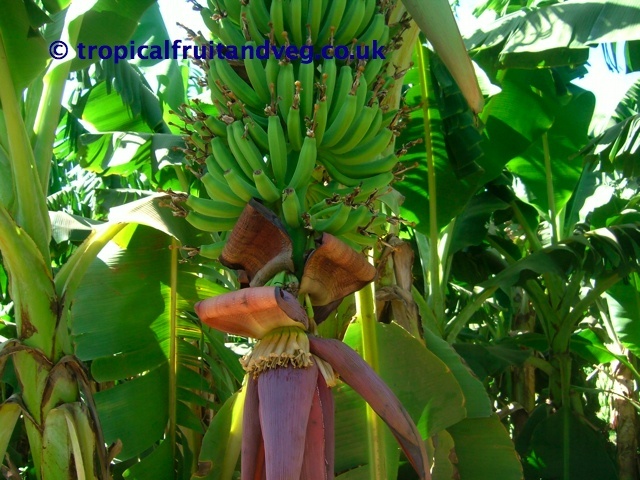 The bracts are soon shed and the fully grown fruits in each cluster become a 'hand' of bananas, and the stalk droops with the weight until the bunch is upside down. The fruit (technically a 'berry') turns from deep-green to yellow or red and may range from 6-30 cm in length and 2-5 cm in width, and from oblong, cylindrical and blunt to pronouncedly 3-angled, somewhat curved and hornlike. The flesh, ivory-white to yellow may be firm, astringent, even gummy with latex, when unripe, turning tender, slippery and soft when ripe. 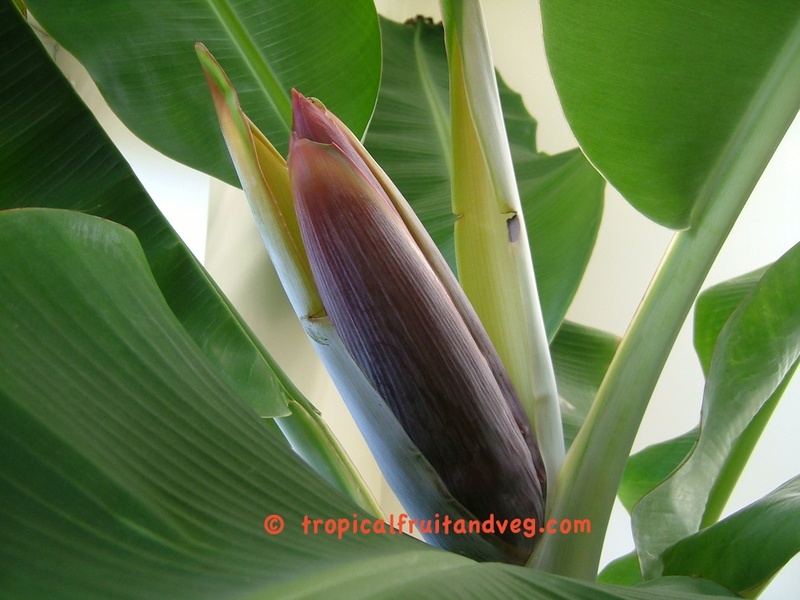 The edible bananas are restricted to tropical or near tropical regions. 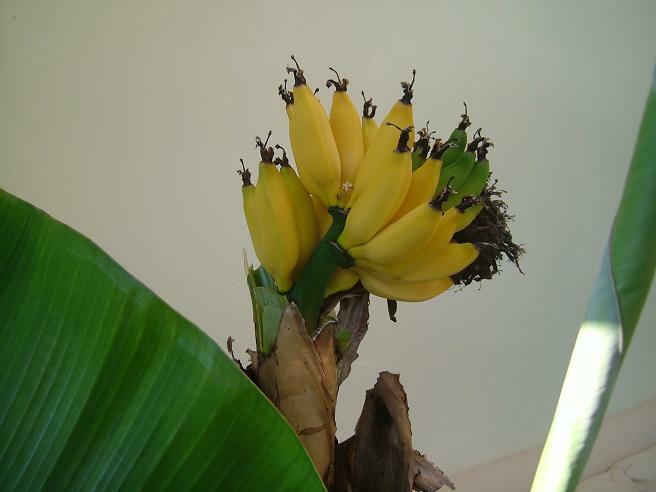 A suitable banana climate is a mean temperature of 26�C and mean rainfall of 10 cm per month. There should not be more than 3 months of dry season. Cool weather and prolonged drought retard growth. 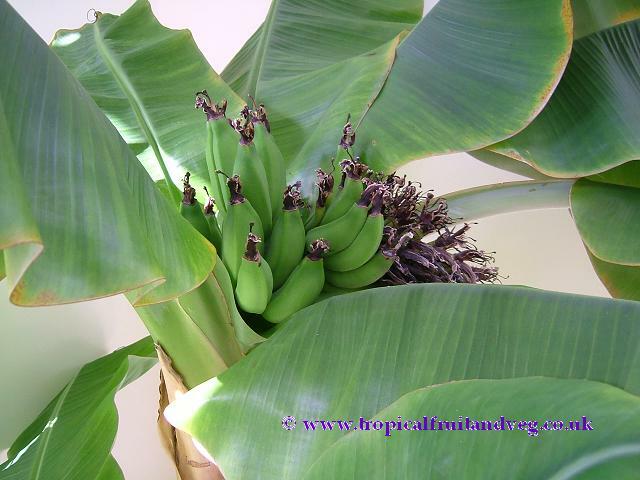 Banana plants produce only one leaf per month in winter, 4 per month in summer. If low temperatures occur just at flowering time, the bud may not be able to emerge from the stem. 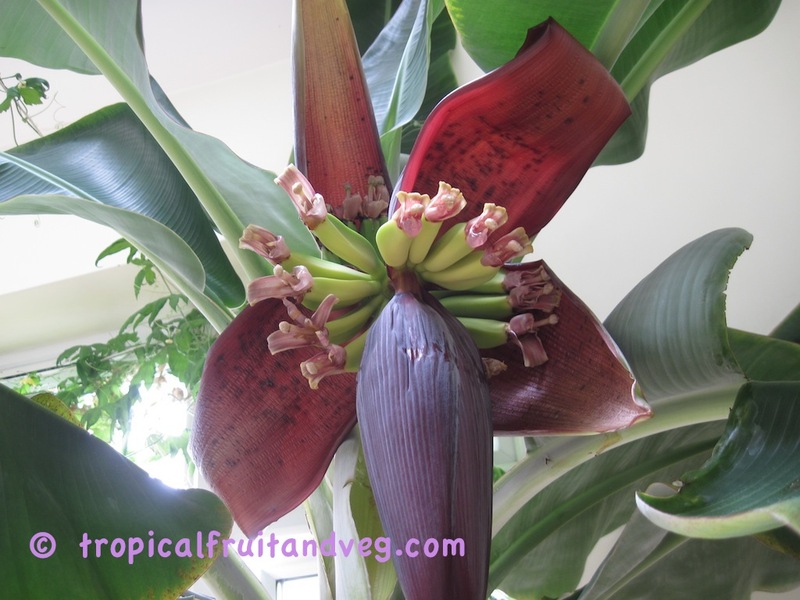 The banana plant will grow and fruit under very poor conditions but will not flourish and be economically productive without deep, well-drained soil�loam, rocky sand, marl, red laterite, volcanic ash, sandy clay, even heavy clay�but not fine sand which holds water. 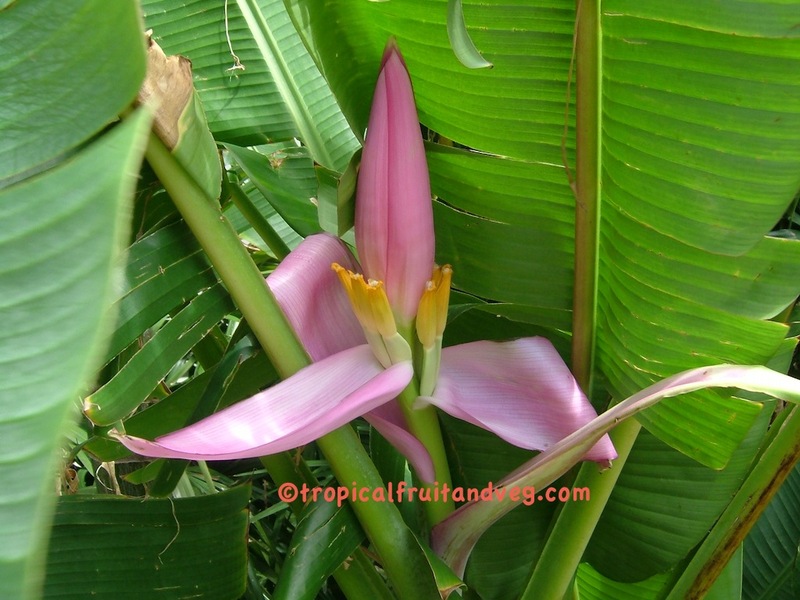 Bananas prefer an acid soil but not below pH 5.0. Banana seeds are employed for propagation only in breeding programs. The common method is the is transplantation of suckers. These should not be too young nor too old. The sucker first emerges as a conical shoot which opens and releases leaves that are mostly midribs with only vestiges of blade. These juvenile leaves are called 'sword', 'spear', or 'arrow', leaves. Just before the sucker produces wide leaves resembling those of the mature plant but smaller, it has sufficient corm development to be transplanted.